Grand in design and size this brooch is illustrious of Hagler�s magnificent wired bead work. The metal is Russian gold- plated. 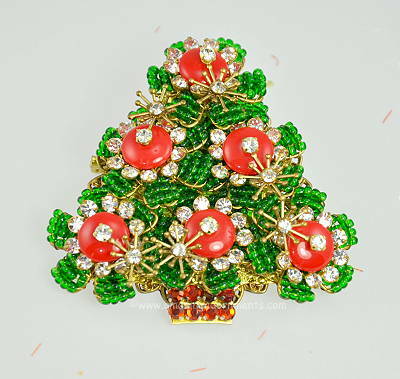 Large red button shaped glass and clear rhinestones are used as decorations along with stars or snowflakes of wiry gold- tone metal and clear rhinestones. The small green glass seed beads form the petals of the layered flowers. All are wired to a double filigree backing. The tree stand is represented by small red prong set chatons. The hallmark appears on the reverse. Measurements: 2 1/4" long and 2 3/8" wide.